ActivePresenter 7 now supports Slide Masters which let you control themes and layouts in slides of a project. Using them is a good way to save time as you can apply the same look and feel across many slides at once. Today let’s learn how to use this feature. Now is the time to dive deep into each of them. When you create a project, your project uses a theme. This theme includes a Slide Master. If you apply many different themes to the project, the project will have many Slide Masters. To work with Slide Masters, you have to access the Master View. As can be seen, the Master View has two main parts: Slide Master tab and the left pane. The Slide Master tab offers many useful commands to work with. Meanwhile, the left pane shows Slide Masters previously set up for the current project. If you make a blank project or haven’t created any Slide Master before, you see a default Slide Master. In essence, a Slide Master gives details about themes, content placeholders, etc. Each Slide Master has a top slide as the master layout and a collection of slide layouts. 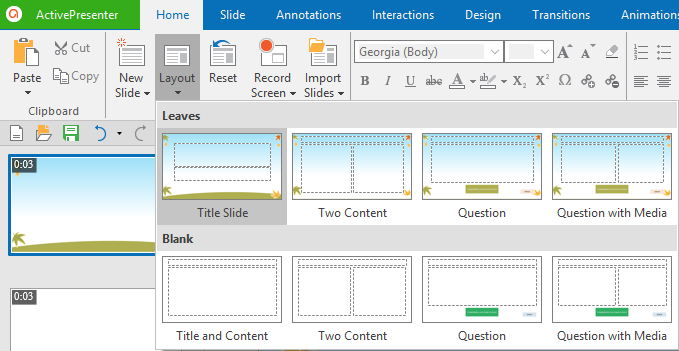 These layouts inherit all properties of their slide master, but you can customize each layout to show specific contents. In addition, the master layout thumbnail is bigger than layout thumbnails. Quick to edit the look of all slides. Come in handy when you have a long project with multiple slides. Easy to add content placeholders like text, images, and questions. Save tons of time as you don’t need to type the same information on more than one slide. This is helpful when your need is a logo, a symbol or a slogan appearing across all slides. Each Slide Master has at least one layout. Whenever you create a project and access the Master View, you always see at least a Slide Master. A project possibly has more than one Slide Master. The Master View is where to create, manage, and customize any Slide Master/layout. It’s impossible to do those tasks in any other places. ActivePresenter allows you to add as many Slide Masters and layouts as you want. This task is done in the Master View. To open the Master View, click the View tab > Slide Master . In the Slide Master tab > Insert Slide Master . Right-click anywhere in the left pane > Insert Slide Master. Then, the new Slide Master with multiple layouts appears at your desired position in the left pane. Select the slide master/layout > Slide Master tab > Insert Layout . Right-click anywhere on the left pane > Insert Layout. After that, the new layout appears with the same theme properties as the selected slide master or layout. It also has a default title text box and three footer text boxes. It’s easy to manage your Slide Masters and layouts in the Master View. You’re able to copy, duplicate, rename, delete, and preserve them. Step 1: Select your Slide Master/layout and press CTRL+C. Or, right-click it and select Copy. Step 2: In terms of copying Slide Masters, click Paste or Paste (Keep Source Formatting) to perform the task. Press CTRL+V or select Paste from the context menu. ActivePresenter will make a copy of the layout in the current Slide Master. Select Paste (Keep Source Formatting) from the context menu. Then, both copied layouts and Slide Master from which they inherit properties are replicated. For information about the differences between these types of Pase, see Copy, Cut, and Paste Slides. Step 1: Right-click your Slide Master/layout. Step 2: Click Duplicate Master/Duplicate Layout in the context menu. If there are many similar Slide Masters or layouts within a project, you should give them descriptives names. This makes it easier to select and use them later. Select a Slide Master/layout > Rename. Right-click a Slide Master/layout > Rename Master/Rename Layout . Then, the Rename Master/Rename Layout dialog appears. Enter a name > OK. Step 1: Select a Slide Master or layout. Step 2: Click Delete in the Slide Master tab. Or, press the DELETE key. Deleting a Slide Master remove all of its corresponding layouts. You can’t delete any Slide Master/layout that are currently being used by any slide in your project. Step 1: Select one or more Slide Masters. Step 2: In the Slide Master tab > Preserve . Then, a pushpin icon will be shown at the top-left corner of the slide master. When adding a new Slide Master, it will be automatically preserved. If you don’t want to preserve a Slide Master anymore, click Preserve again. In this case, ActivePresenter displays a confirmation dialog to ask if you want to delete it. This dialog doesn’t appear when that Slide Master is currently used in the current project. 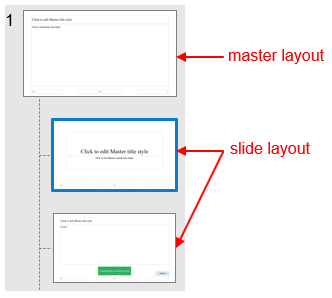 To customize a Slide Masters/layout, you have to open the Master View. Then, you can use most tools on tabs like Home and Annotation to do this task. Bear in mind that some commands are unavailable (dimmed) in this view. 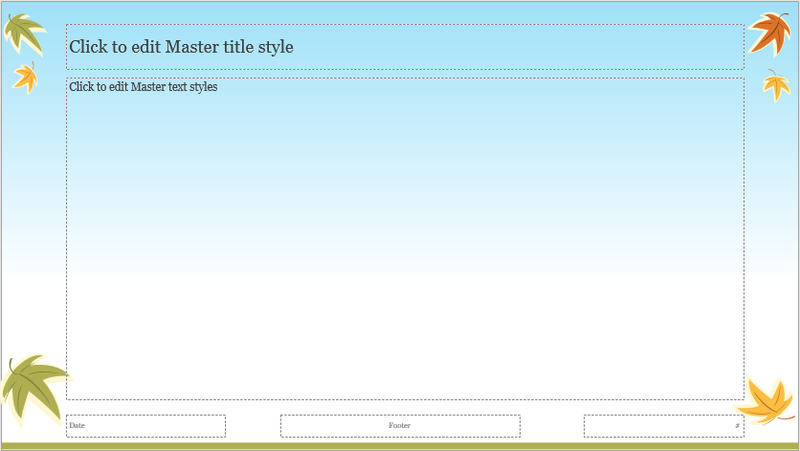 Master Layout : Add or remove placeholders like title, text, date, footer, and slide number in Slide Masters. However, this option is available for the master layout only. Insert Placeholder : Add placeholders to a layout. There are 7 types of placeholders, including Content, Text, Image, Video, Media, Question, and Report. This option isn’t available for the slide master. Title: Display a title placeholder on layouts if it’s checked. Footers: Show a footer placeholder on layouts if it’s checked. Themes : Apply a consistent theme to your Slide Masters/layouts. Colors : Use consistent Theme Colors for your Slide Masters/layouts. Fonts : Use consistent Theme Fonts to your Slide Masters/layouts. Background Styles : Apply a Preset Background Style to Slide Masters/layouts. Slide Sizes : Change the size of Master Slides. See Changing Project Size for more details. Note: After finishing the design phase, you need to exit the Master View to see the change. To do that, click Close Master View in the Slide Master tab. Then, the changes you made to Slide Masters and their layouts will be automatically applied to slides which are based on them. In addition, when you click New Slide and Layout in the Home tab or Slide tab, you see new slide layouts are updated. ActivePresenter allows you to add background graphics to themes with the Background Fill feature. With this in mind, you have freedom to create beautiful themes like this in minutes. For more information, see Modifying Slide Background. When you make any change to Slide Masters, it’s a good idea to review your projects for seeing how the change affects each slide. Thus, you can know which slides don’t look exactly right the way you want. You’re free to edit Slide Masters any time while making a project. But it’s better to edit Slide Masters before adding slides. If you do that later, some items on slides like objects may not conform to the new slide master design. 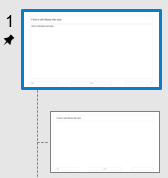 There are two ways to use slide layouts for slides in the current project. That is, change the layout of existing slides or insert new slides. Step 1: Choose any of the following to access the layout gallery. Select one or more slides > Home > Layout. Do the same way above. But go to the Slide tab > Layout instead. Right-click selected slides > Layout. Step 2: Select a layout from the layout gallery. Then, the layout you choose is applied to all selected slides. Step 1: Specify the location you want to add a new slide. Step 2: In the Home tab or Slide tab > New Slide. Step 3: Select your desired slide. That’s all about using Slide Masters in ActivePresenter 7. Try it right now, and you will find it very useful when designing eLearning contents. Feel free to contact us if you need any help.